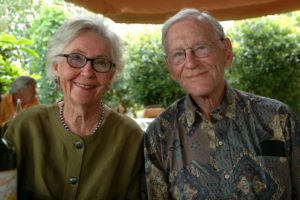 Richard & Mary Alice Frank were philanthropic during their lifetime and will keep supporting the Pasadena community in perpetuity through their named endowment created by a bequest to the Pasadena Community Foundation. While attending Pomona College, he met Mary Alice Bentley. They enjoyed a long, happy, and fulfilling life together for 65 years. He became president and CEO of Lawry’s Foods, Inc. in 1956. Mary Alice worked closely with her husband as he grew Lawry’s Foods and Lawry’s Restaurants into world-renowned businesses. On her own, she established a successful interior design firm. In addition to their successful businesses, the Franks were committed to the community in which they raised their three children. Richard Frank was a lifelong Pasadena resident. Mr. Frank created Lawry’s Beef Bowl, the famed annual event that treats the Rose Bowl competitors to evenings of food and celebration the week prior to the game. Mary Alice was a long-term member of the Pasadena Art Alliance, and served for a number of years on the Pasadena Design Commission. Their son, Richard R. Frank served as the community foundation’s Ambassador for Human Services during the 60th anniversary year, representing the family’s three generation involvement with AbilityFirst. The Richard and Mary Alice Frank Endowment will support PCF’s local grantmaking.